EFFECTIVE AND INNOVATIVE - MEETING THE CHALLENGES OF YOUR INDUSTRY. Every industry should push its boundaries – we at Creavey Seal are firm believers in that and it is a part of our corporate DNA. Creavey Seal understand that Pharmaceutical and Medical applications often require demanding sealing solutions that are able to offer compliance to a variety of industry standards, temperature capability and chemical resistance. The seals used in a variety of applications must be able to cope with an extensive range of process media and aggressive cleaning and sterilisation processes as well as adhering to industry hygiene standards. In meeting the needs of the pharmaceutical and medical markets we constantly challenge our own processes, products and solutions to ensure that they are the most technically advanced. This means we are able to meet and exceed client expectations and are qualified to major industry standards. Creavey Seal offers a comprehensive range of high performance sealing materials and solutions, optimised for demanding and performance-critical applications within the Pharmaceutical and Life Science Industry. From standard off-the-shelf encapsulated seals through to engineered, bespoke inflatable and moulding solutions, Creavey Seal deliver on time and on budget, be it for one-off or volume quantities. Creavey Seal, with the support of NES, also provides a comprehensive range of services designed to assist with material selection, materials testing and failure analysis. For information relating to the selection of material compound for pharmaceutical applications please click on the links below to access our material compound database. 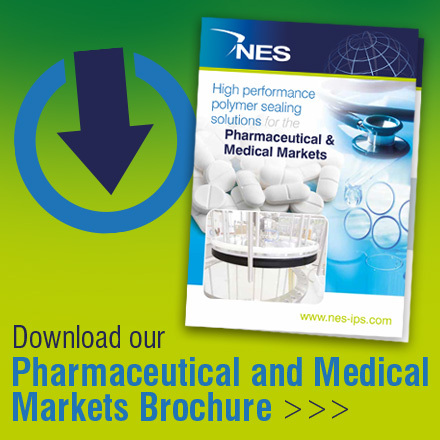 We have a varied amount of products / compounds suitable for the Pharmaceutical Industry. These are categorised by 'Material Type' below. To view the datasheets available, simply click on the link.